The past two days have been beautiful. We flew both days in moderate winds and sunny skies. Yes, very sunny. And tonight I am radiating heat and glowing in the dark. I should know better than to stay out on the beach for up to three hours a day and not expect to get burned. But it’s only April-May and, for me, it’s too early in season to worry about sunburn. So, lesson learned. The sunscreen comes out as soon as the weather gets warm enough to wear short sleeves without a jacket. Now I’ve got to get my legs caught up with my arms so I can wear shorts. Well, maybe not. My legs are in no way up to wearing shorts, even tanned. Let me rethink things. As for flying, we had two great days. Forgoing the lawn mowing, the furniture moving, the laundry and the dishes, we went to the beach Saturday morning. The forecast was for the winds to get lighter in the afternoon so the morning was the best time. Or so we thought. The morning winds were light and gusty. Changing directions every fifteen minutes or so it seemed. 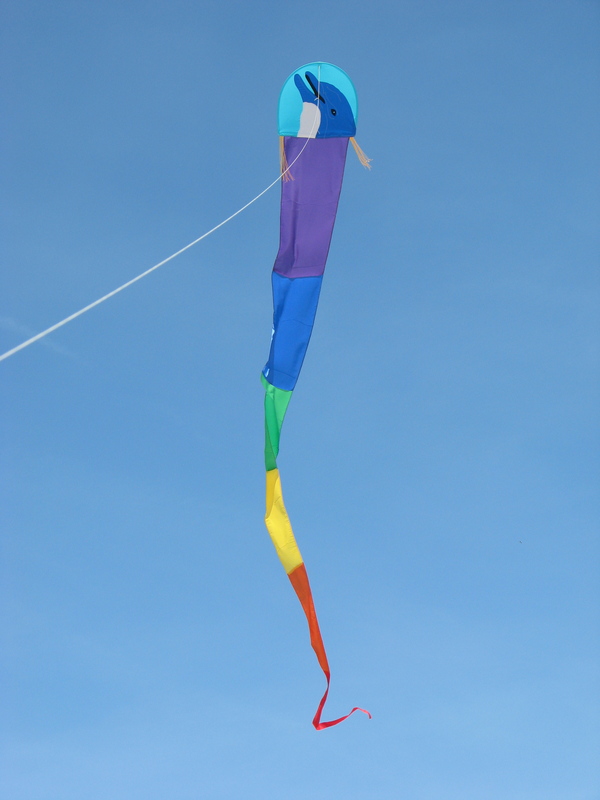 We put up three smaller single line kites but they just wouldn’t stay up for long. Couldn’t turn our backs or they would be on the ground. Talk about a tease. They would hang in the sky just long enough to give us hope and then slowly drift back to earth. And each time we would put them back up it would be in a different direction. I finally gave up on the dragon kite with the dolphin. Back in the bag it went. I also tried to fly the white owl by Premier. With some bridle adjustment, it flew pretty well. The best flyer of all yesterday was the turtle easy flyer delta, also by Premier. It would lose the wind for a bit and drift downward but then gather it up again and mount into the sky. Guess that’s why they call it an easy flyer. Despite the weather forecasts, the wind picked up as it drew closer to noon. I took the Spirit Quad out for some practice. I was doing pretty well except for trying to do some inverted hovers and tip stands. The hovers were turning into hard upside-down landings. No broken spars, thank goodness. But I did notice that the center vertical spar was starting to stick up above the sail higher and higher. Didn’t seem to affect the flying any so I decided to check it out when I was done for the day. Well, when I was packing the kite up, I saw where the spar had punched through the upper pocket. A very nice small hole. Now I have a repair to do. The decision is whether to merely patch the present pocket or to remove the pocket entirely and make a whole new pocket. My present thought is to make a whole new pocket and re-enforce the top so it doesn’t happen again. Another in a list of things to get done. An ever-increasing list. This morning was the weekly club fly. Again it was a gorgeous day. The wind was twelve to fourteen. And there were several people out to fly. Regulars and new-comers. We filled the sky and had dual liners and Rev fliers performing. 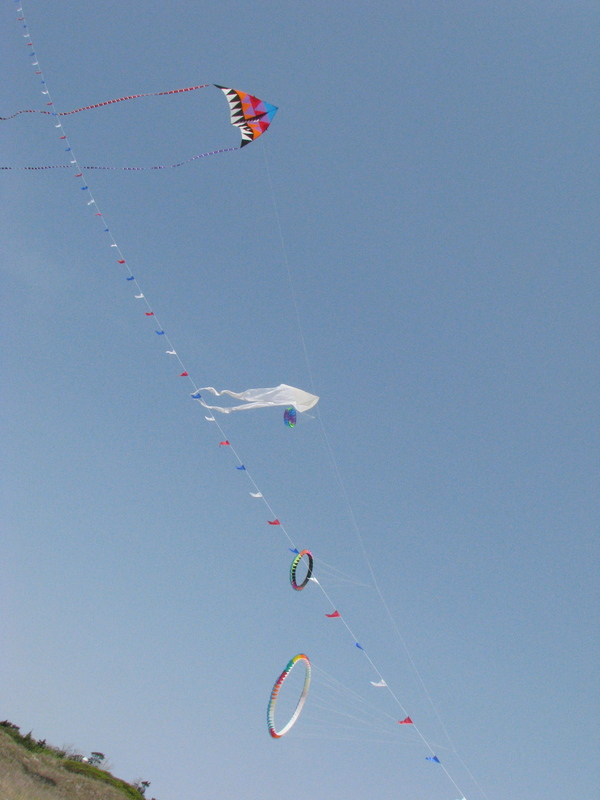 There were large deltas up with long tails and a sled with matching pennant tail by Gomberg Kites. Both of these carried lots of line laundry. A couple of ghost deltas and Merlin the Wizard dragon, which flew better upside down, were also in the air. Add to that my three Xelons and some miscellaneous sleds and deltas and there was quite a show today. We don’t understand the Wizard kite. It would fly for a while normally and then, for no apparent reason, it would flip over and fly with the bridle on top and the spars down. Most unusual. I received a Mother’s Day present early and really wanted to see it in the sky. It is a Buka-Dako-Esche by Premier. 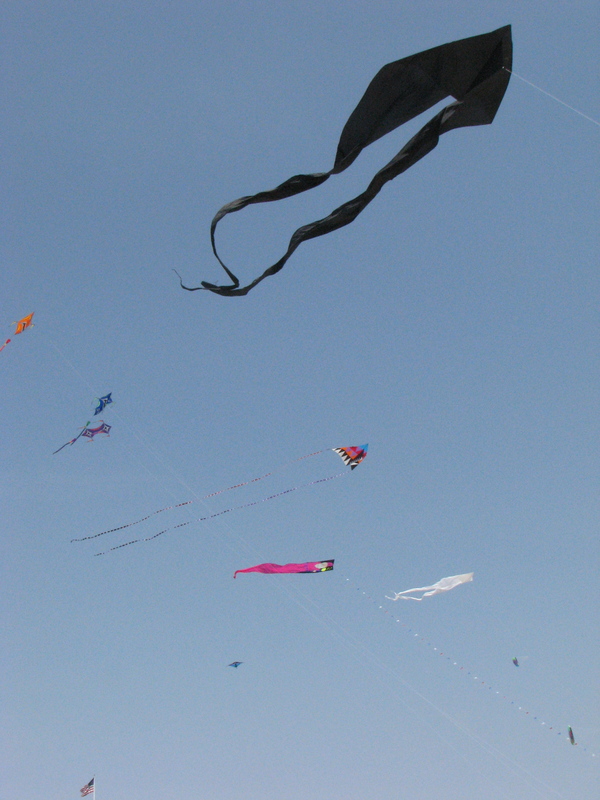 It is a very large rectangular kite with a looped ribbon tail that has an aboriginal representation of a lizard in browns, black, yellow and white. The first time I saw it I knew I had to have it. It is a companion kite to my Gecko Totem, also by Premier. The same aboriginal style and colors. My thought for the day was to fly the pair and get some photos. Well, we had trouble with the lizard. It would go up and stay for a bit, then tilt to the side and fall to the ground. At one point, I thought I was going to take out a beach-walker. 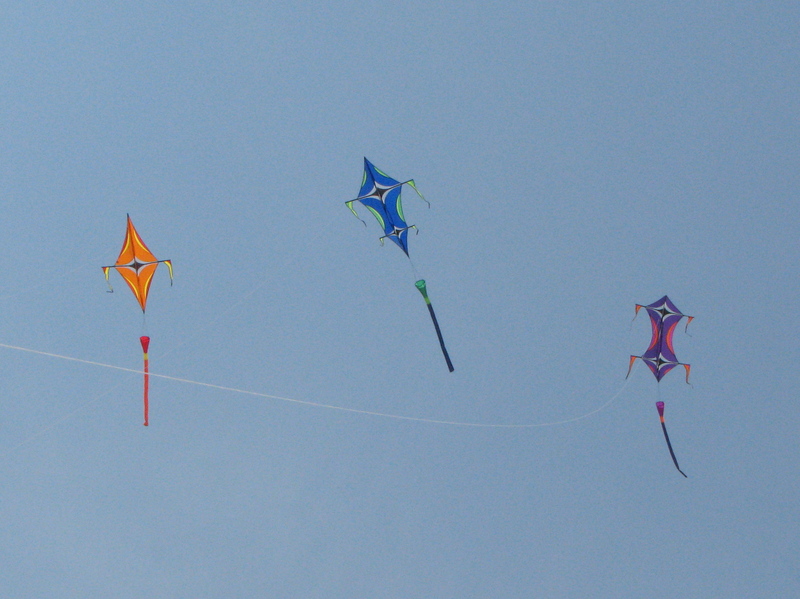 Not to mention the neighboring kites. Not wanting to cause an accident, we put it back in the bag and would try for a solution at a later time. Then I got the Vamp Devil out again. There were a couple of Rev fliers on the beach with me and so I was a little nervous. I am only a beginner with the quad line kites and didn’t want to embarrass myself. At first, it flew rather sluggish. Almost as if the brakes were on it continually. I readjusted the handles and then removed the devil tail. Having no better place to put it, I wrapped the tail around my waist a few times and tied it so it wouldn’t blow away. I know it sounds silly and probably looked silly, too. But I only had a couple of pockets and stunt kites require two hands. Anyway, the kite flew much better and I had fun practicing side slides and hovers. Tried some spins but not too many. I was working mostly on control not show. All in all, it was a great weekend. Except for the sunburn. The second day did nothing but increase my red glow, so I sit tonight bathed in aloe. And, by the way, we found a problem with the bridle on the lizard. That may or may not be the solution to the nose-dives. We will find out the next good flying day.